This audiobook review by Graciela Sholander was originally done in January 2006 and can be seen on Amazon.com. This concise introductory audio program provides the responsible property investor an overview of “subject to” mortgage transactions. If you’ve heard about “subject to” and wonder what it’s about, and whether or not this type of transaction is right for you, then The TurnKey Investor’s “Subject To” Mortgage Success Secrets by investment expert Matthew S. Chan is a must-hear! 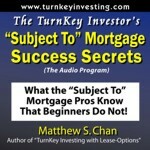 This audio program works well as an introduction to the subject or as a companion to the book, The Turnkey Investor’s “Subject To” Mortgage Handbook, written by Chan. The audio program offers a clear overview along with expert personal insights. It’s narrated by Chan, who candidly shares both the pitfalls and the benefits of buying property through a “subject to” clause. According to Chan, when handled responsibly and intelligently a “subject to” mortgage is an effective way of buying properties, but it’s not for everyone. He carefully spells out who you need to work with and what you need to do to make this transaction a success. Chockfull of examples taken from his own personal experience, the audio program provides enough information to help the seasoned investor decide whether or not this type of transaction is of interest. And as a companion to the handbook, the audio program supplies valuable information that complements the book. Listening to the program is equivalent to sitting face to face with Chan, picking his mind to find out what worked for him and what lessons he learned from his own personal involvement with “subject to” mortgages. If you are a responsible and experienced property investor who wants to learn more about the “subject to” investing option, start with The Turnkey Investor’s “Subject To” Mortgage Success Secrets CD audio program. This comprehensive 45-minute program is short enough to listen to as many times as you need to absorb essential insider’s information. Once you’re ready to learn more, move on to the companion handbook … but refer back to the CD often. Chan’s clear explanations and calm delivery are sure to keep you grounded, ultimately helping you decide whether or not “subject to” is right for you. Overall, this is a well-executed, highly informative introductory audio program. Special thanks to Graciela for taking the time to review my audiobook. Special thanks to Graciela for taking the time to review my audiobook.